Click here to join in the celebration and order your luminarias! This year the Recreation Committee is organizing the sale of luminarias to beautify our borough and help fundraiser for future recreation activities and events. Luminarias will be displayed for one night – December 9 – to enhance Interlaken’s Old Fashion Tree Lighting Ceremony and to personalize our town. Residents will be able to purchase luminary kits for their own property as well as sponsor additional kits which will be placed around the Borough Hall property. 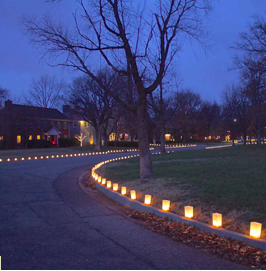 For the best results, luminarias should be placed along the sidewalk, closest to the street, in a single row and every 3 feet. 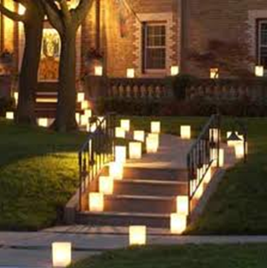 Residents can also display luminarias up their front walkway in either single or double rows. If you have not received a Luminary Order Form in the mail, please contact the borough’s office. Don’t end up at the last minute empty handed without your supplies! The term luminarias or ‘festival lights’ are said to originate from Spaniard merchants. They were impressed with the paper lanterns from the Chinese culture and decided to make their own version when they returned to New Spain; particularly during the holiday season. They decided to use more "hearty" materials. Traditionally, luminarias are made from brown paper bags weighted down with sand and illuminated from within by a lit candle. These are typically arranged in rows to create large and elaborate displays.